You cannot beat these prices! 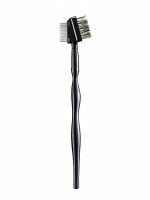 This brush is sturdy and gets the job done perfectly. The set is super chic looking and great for travel. My mother does not use anything but Sonia Kashuk because of how cheap and high quality this line is and she has been using make up for quite a bit of time. hehe. I would definitely recommend this or ecotools for your drugstore brush collection! Sturdy and grooms my brows perfectly. High quality and would definitely recommend to friends! How does anyone live without it?!? Seriously girls! A typical brow groomer is not enough. Sick of repurchasing those cheap plastic ones because the comb bristles break? sick of the bristle being too far apart to actually smooth out the mascara clumps? Get this heavy duty makeup essential and get on with your life!